"May I help you? I want to cut something!!" He wants to help his mother. But his mother gets annoyed every time. 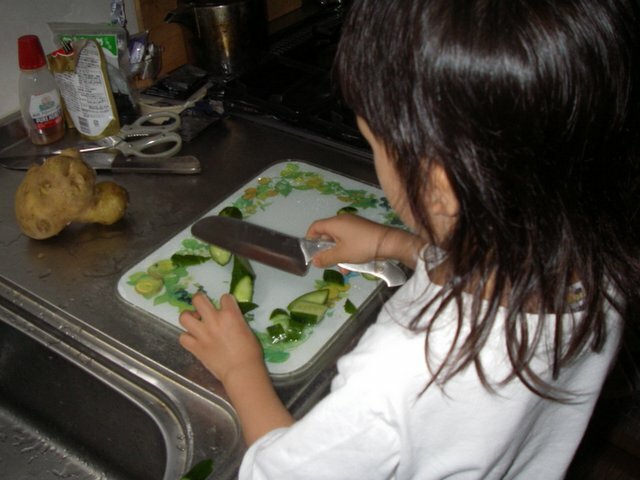 He is cutting a cucumber. But, if his favorite TV show starts, he gives up his work. By the way, he has long hair now. Sometimes, people misunderstand and think that he is a girl. His father likes his long hair. Because, his father wanted a daughter. Anyway, I am annoyed his strong behavior. I like markets. 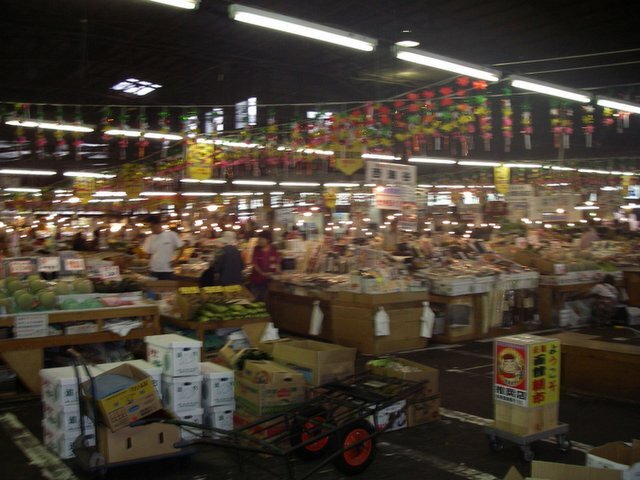 Especially, I like to visit markets in foreign countries. 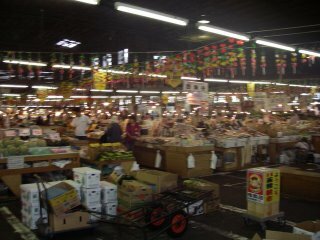 I have ever visited markets in Australia. I want to visit market in New York some day. Japanese eat crabs sometimes. In Hokkaido, we can eat fresh crabs. But they are expensive. 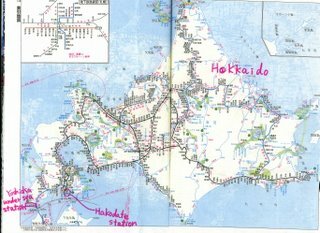 By the way, after our Hokkaido travels, a Japanese fisherman has been shot dead by a Russian patrol boat. 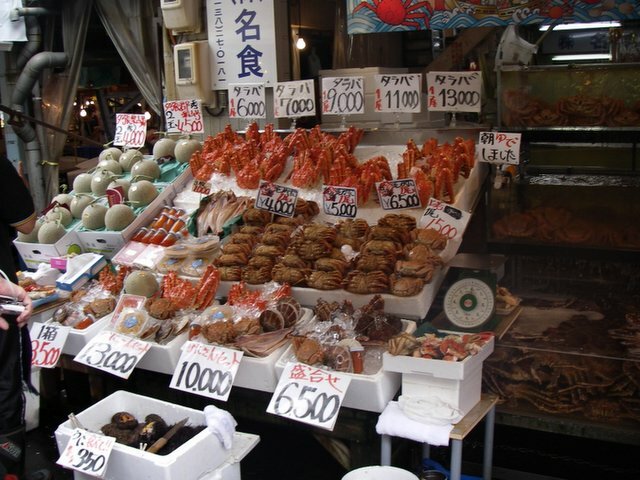 Japanese fishermen just fished crabs. Why Russian did kill the fisherman? Japanese didn’t have guns. It is difficult to answer about it. Because it is programs of nations. Anyway,I think , if someone is killed to take crabs, I should not eat crabs. There were a lot of fireworks in the summer season in Japan. Fireworks are a symbol of Japanese summer. When the fireworks are finished, we would find summer finish. Sas found the First Sign Of Fall in her country. It is still hot in Japan. But at this time of year the days are shorter... I feel sad. 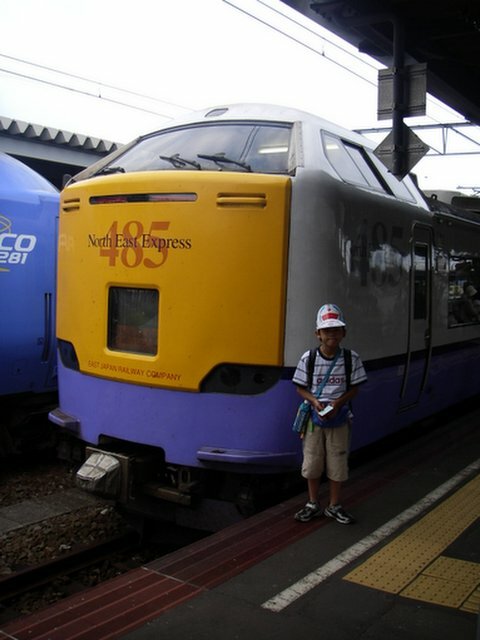 When we got on a berth train, my older son really wanted to keep the top bunk. But I didn’t permit it. 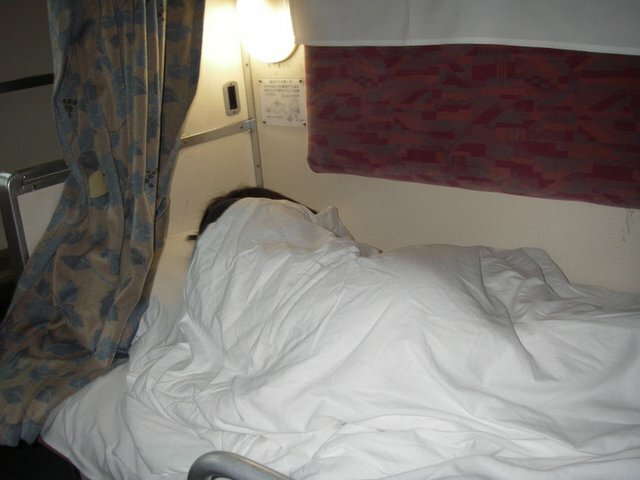 So he hid and cried on the button bunk. He insisted that he would not fall on the floor!! I thought the top bunk was completly high, he will have done it by the time he us 18 years old. 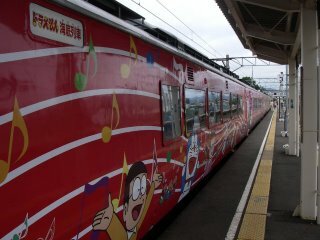 After that he asked the berth train's conductor. 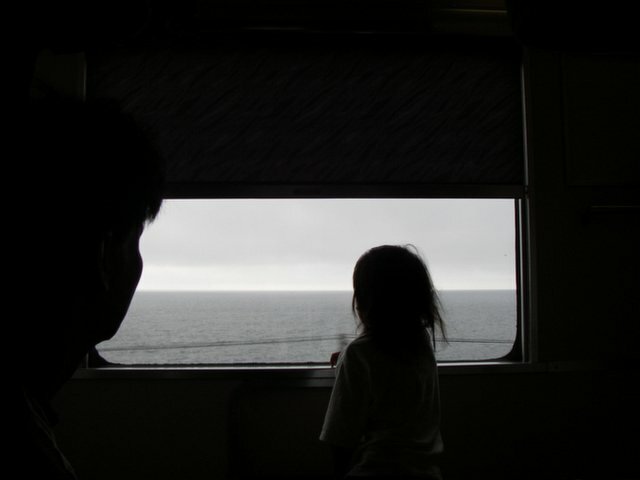 The berth train of conduoctor said "I have not heard of it yet." 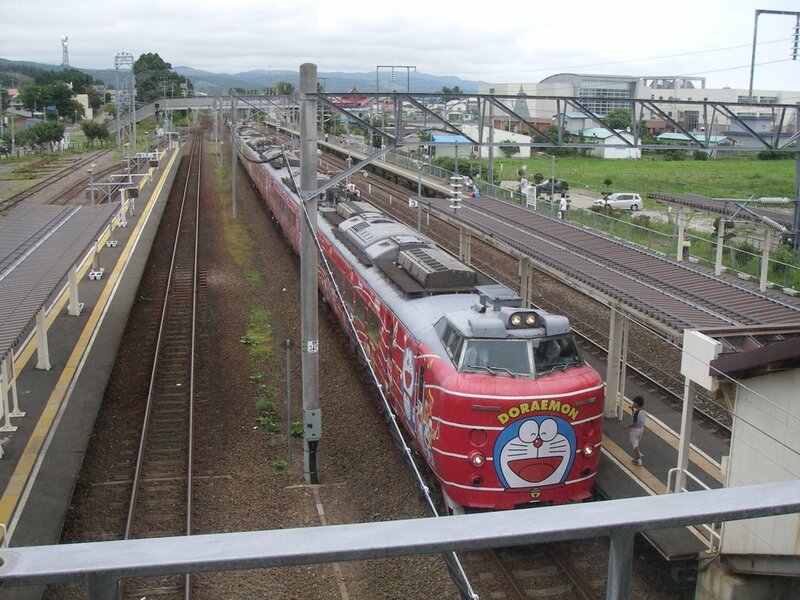 We went to Yoshioka undersea station by trains which was Doraemon undersea trains. You asked me " What's an undersea station? " 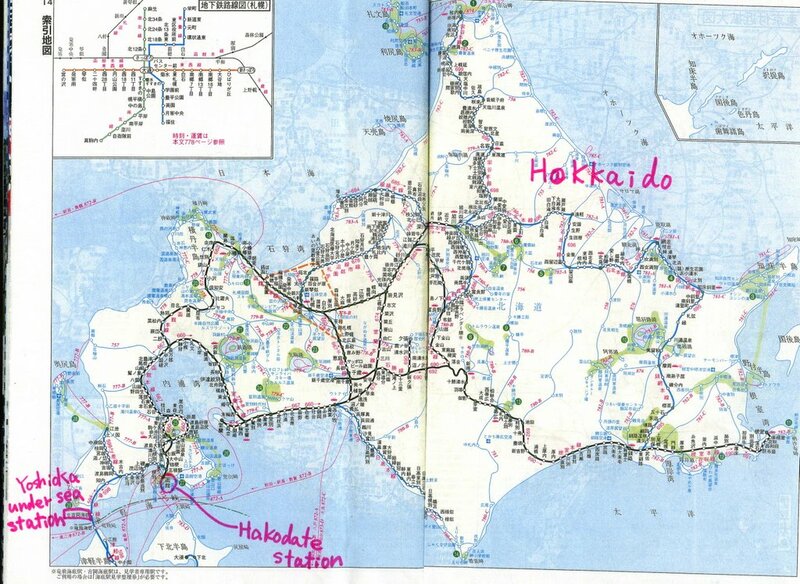 First, I have to explain about Japanese topography. 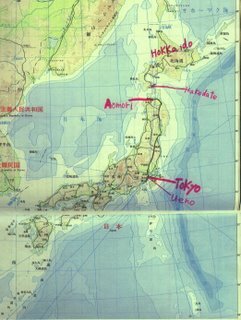 Japan is islands country. And there are seas around islands. Second, When we want to go from the Honshu region to the Hokkaido region, we have to be over Tsugaru strait. When it was in ancient time, people ferryed by ships which were sometimes wrecked in winter season. Of course , now we can take on safe ships, planes , trains.. 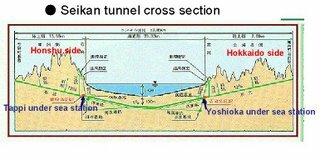 I added a little bit something in English to "Seikan tunnel cross section"
Finally, you understand there is "Yoshioka under sea station" is under sea. 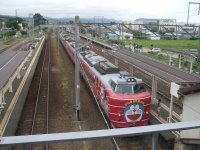 This is a Japanese sight http://www.hakodate.or.jp/JR/tonnel/default.htm, I quoted this picture. 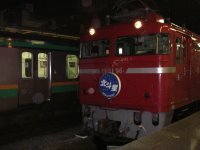 Seikan tunnel was built under Tsugartu strange in 1988. 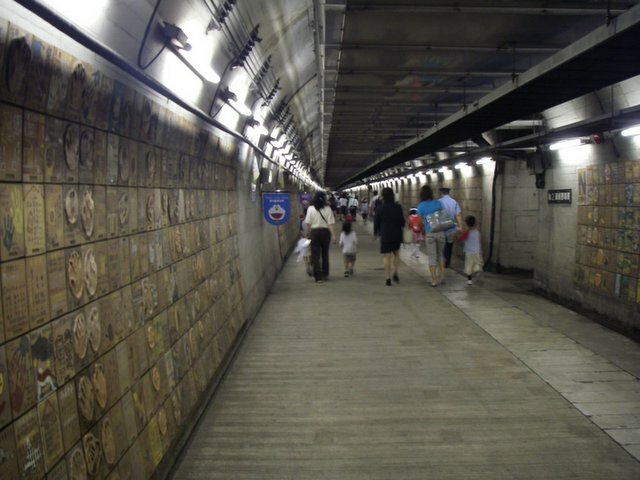 This tunnel is for trains only. 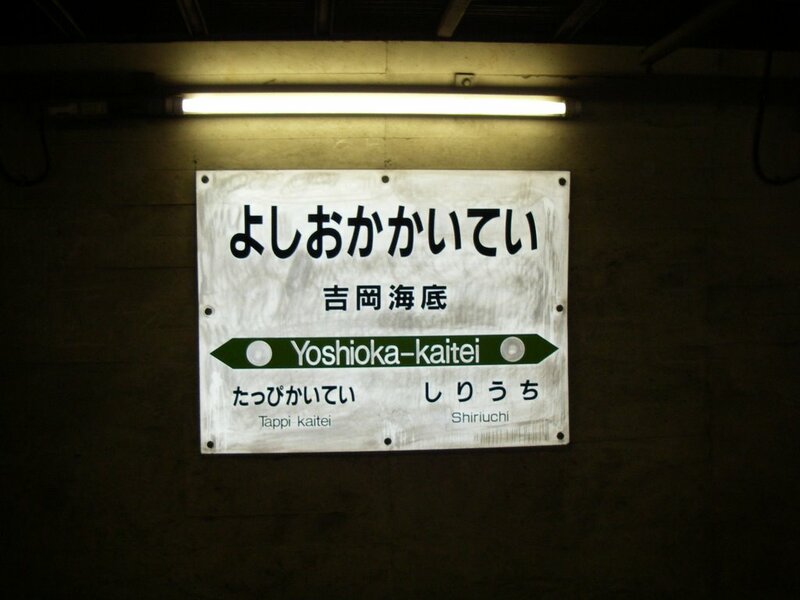 Japanese said Seikan tunnel was the longest tunnel in the world. But Kieran might not say same opnion. 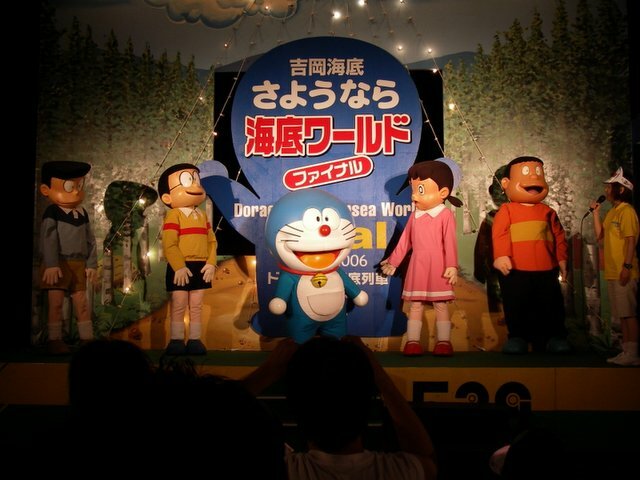 Doraemon Final stage. Before Szélső Fa said she didn't know Doraemon. 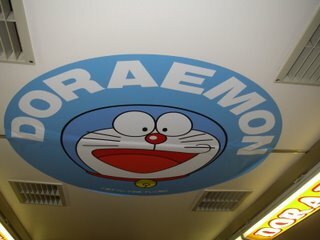 I think Doraemon was a famous cartoon in Asia. There are five kinds of train's boxes which are special for kids. But Draemon trains and events were last this summer. 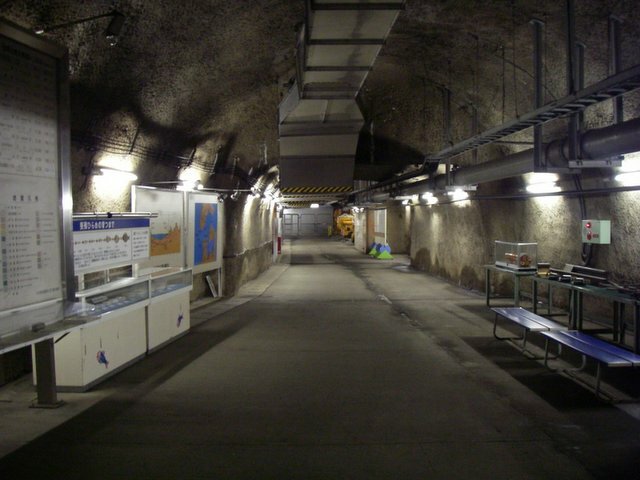 Because, Seikan tunnel visiting course will have been stuff area for bulting Hokkaido shinkansen in one year. 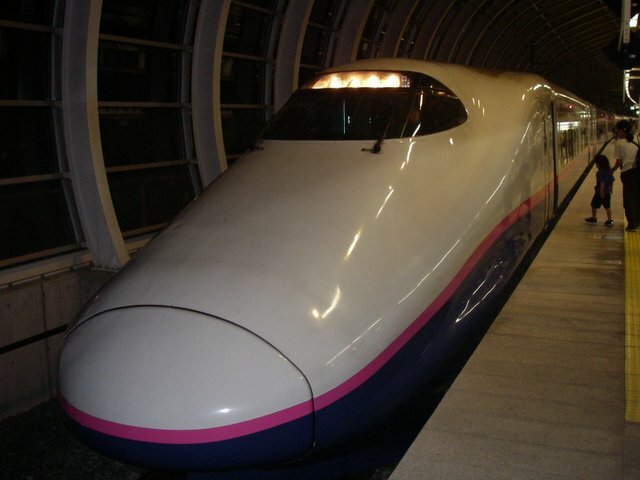 Hokkaido Shinkansen will run about 2015. 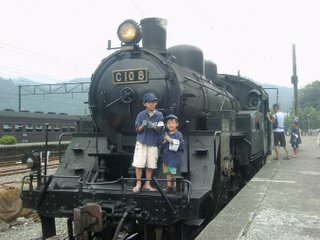 We went to the Hokkaido region. 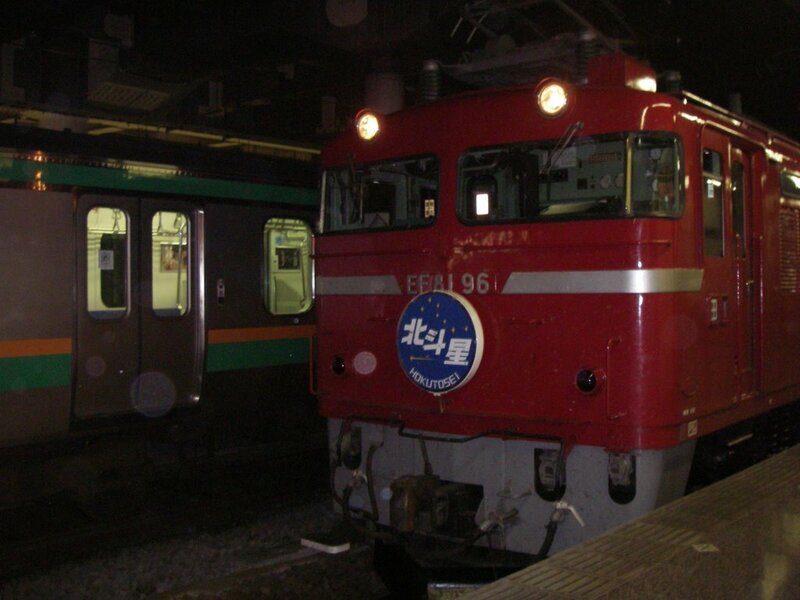 We took a lot of kind of trains. 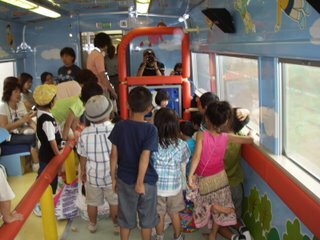 Our kids enjoyed them. We are going to the Hokkaido region!! 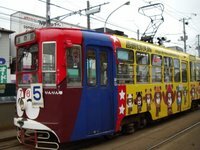 But it is a only two days trip. hours by car from our town. 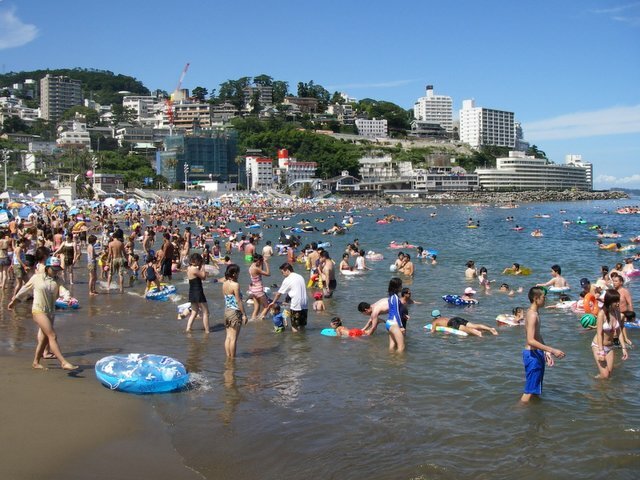 When we arriverd in Atami in the early morinig, there were a few people on the beach. 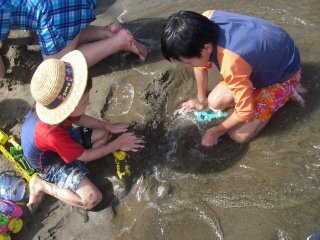 Kids like to play with the sand. While they made a mountain and a tunnel, waves broke them. Szélső Fa asked me "Why are there so many people here?" 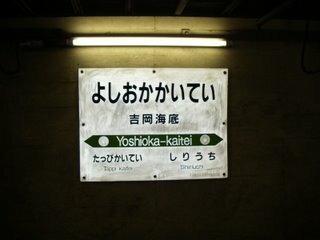 I think Japanese take holidays in same days, or week. 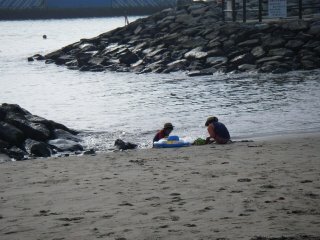 And it was very a hot and a nice day for swimming. You don't think about this crowded beach!! But that is Japan! 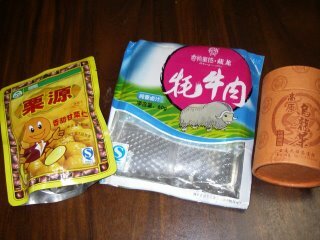 My mother- in-law gave us souvenirs which were made in China. She thought she bought one of a beef jerky. After we ate it, our opinion that it tasted like corned beef. We saw front of the package, we thought this animal was a bison. The end, we read back of the package. It said "Ingredient tables: Fresh yak meat, vegetable oil, salt, and spice"
That was yak meat!! Yak and bison must be kinds of cows!! PS. I like Chinese food very much. 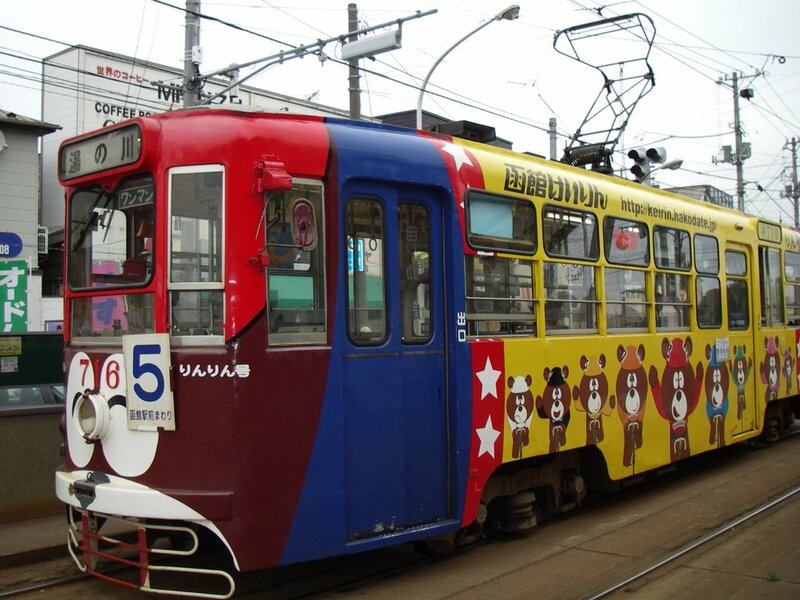 But I think this is just souvenir for foreigners. If we ate yak meet cuisine in Chinese reastrant, it would be delicious. 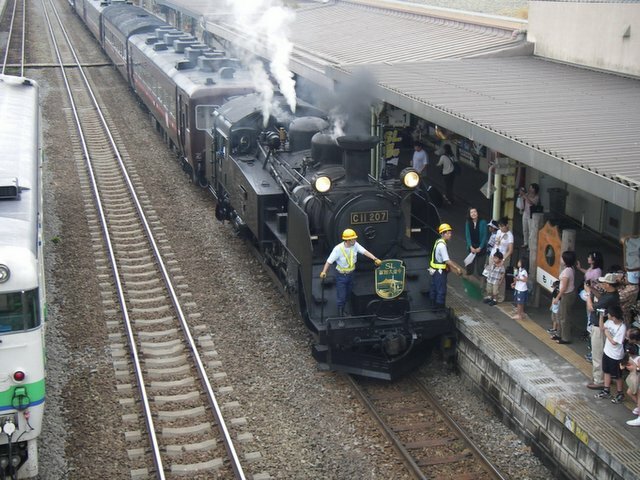 This steam engine is "Ooigawa railroad" in Shizuoka prefecture. Every summer, this steam engine run, it is temporal. This summer, it will run again. When I read Rebecca 's commnts about my blog, I remenbered this picture. 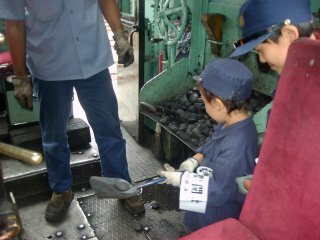 This engine room was very hot. When my younger son tried to put a coal in the fire box, he was afraid of fire. Anyway they enjoyed it.